All estate agents in South Africa who have achieved competency in their NQF Level 4 qualification must then move on to writing their Professional Designated Exam Level 4 or PDE4 exam in order to achieve Full Status. This exam is set by the Estate Agents Affairs Board (EAAB); exams are held in each province about four times a year. You must book for this exam with the Board as soon as you receive your NQF 4 competency certificate from Services SETA. The four-hour PDE4 exam covers all knowledge and practical applications you have studied in the field, as contained in your NQF 4 learning material supplied by the Board. Because of the time delay from writing your NQF4 to receiving your competency certificate, you will need to “brush up” on your knowledge. Once you have the PDE 4 exam behind you, you will be issued with a fidelity fund certificate (FFC) stating that you are a Full Status agent. Prior to this, your status will remain that of Intern. To help you through this process, we’ve developed an innovative e-Learning course for all estate agents in South Africa to help prepare you for your PDE4 exam regardless of which provider you studied with previously. This online PDE 4 course, over and above covering the requirements set out by the EAAB, will provide you with templates, examples of past exam questions, study tips, knowledge on where to concentrate your studies in the material provided by the Board, and easy to follow calculation and statistic sheets, as well as flash cards. As this is an open book exam, we also show you how to systemise and access the information that you take into the exam. Over and above the course material, PropAcademy supplies you with an instructional video, webinars and your own friendly facilitator whom you can contact should you have queries. If you are based in Durban or surrounds, you have the option of attending a face to face workshop instead of working through the online course. Click the “Take this Course” button below to purchase this estate agent PDE4 course today! An introduction to the exam including both EAAB tips and general study tips, helping you decide which section of the exam to answer first, and how to allocate your time in the exam to the different sections. We also provide schedules containing statistics, calculations, definitions, flash cards, the Code of Conduct summarised as well as the Estate Agents Affairs Act. We show you how to use them and personalise them to your exam requirements. You will also be given examples of past PDE4 exam questions with model answers. PropAcademy supplies you with an index for your EAAB NQF4 Study Material, however this is a free add on resource, as Prop Academy will not refund Learners due to the index not suiting all versions of the Study Guide. The index we have provided only works on the EAAB NQF4 Study Material files that contain 1607 pages, or the original Study Material File that is numbered according to the chapters – eg Page 19.11 or page 12.2 etc etc. In order to take advantage of this free Resource, you must obtain either of these specific study guides and not any of the later versions which all have differing page numbers and are therefore inconsistent with the Index. 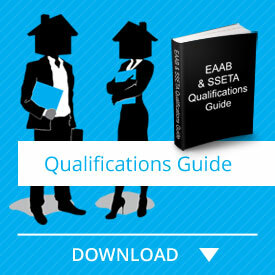 The EAAB NQF4 Study Material needs to be purchased by you from the Estate Agents Affairs Board (EAAB) website, the price of which will be found on the “Schedule of Fees” on the EAAB website, however we advise estate agents to borrow the old version in order to take advantage of this amazing free add on resource. Website by inMotion Graphics. Copyright © 2019 PropAcademy. All rights reserved.